The United States Census Bureau (officially the Bureau of the Census, as defined in Title 13 U.S.C. § 11) is the government agency that is responsible for the United States Census. It also gathers other national demographic and economic data. 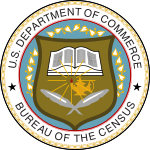 As part of the United States Department of Commerce, the Census Bureau serves as a leading source of data about America's people and economy. The most visible role of the Census Bureau is to perform the official decennial (every 10 years) count of people living in the U.S. The most important result is the reallocation of the number of seats each state is allowed in the House of Representatives, but the results also affect a range of government programs received by each state. The agency director is a political appointee selected by the President of the United States. From 1790 to 1840, the census was taken by marshals of the judicial districts. The Census Act of 1840 established a central office which became known as the Census Office. Several acts followed that revised and authorized new censuses, typically at the 10-year intervals. In 1902 the temporary Census Office was moved under the Department of Interior, and in 1903 it was renamed the Census Bureau under the new Department of Commerce and Labor. The department was intended to consolidate overlapping statistical agencies, but Census Bureau officials were hindered by their subordinate role in the department. By law the Census Bureau must count everyone and submit state population totals to the U.S. President by December 31, 2010. States within the Union receive the results in the spring of the following year. Clarify if they are employing a representative workforce. The United States Census Bureau is committed to confidentiality, and guarantees non-disclosure of any addresses or personal information related to individuals or establishments. Title 13 of the U.S. Code establishes penalties for the disclosure of this information. All Census employees must sign a sworn affidavit of non-disclosure prior to employment. US Census Bureau Regions, centered on and divided by its twelve regional offices. Since 1903, the official census-taking agency of the United States government has been the Bureau of the Census. The Census Bureau is headed by a Director, assisted by a Deputy Director and an Executive Staff composed of the associate directors. In April 2009, President Barack Obama nominated Robert M. Groves to head the Census Bureau. Census headquarters in Suitland, Maryland. The Census Bureau has had headquarters in Suitland, Maryland since 1942. A new headquarters complex was completed in 2007 and supports over 4,000 employees. The Bureau operates regional offices in 12 cities: Boston, New York City, Philadelphia, Detroit, Chicago, Kansas City, Seattle, Charlotte, Atlanta, Dallas, Denver, and Los Angeles. The National Processing Center is located in Jeffersonville, Indiana. Additional temporary processing facilities are used to facilitate the decennial census, which employs more than a million people. The cost of the 2000 Census was $4.5 billion. During the years just prior to the decennial census, parallel census offices, known as "Regional Census Centers" are opened in the field office cities. The decennial operations are carried out from these facilities. The Regional Census Centers l oversee the openings and closings of smaller "Local Census Offices" within their collection jurisdictions. The estimated cost of the 2010 Census is $14.7 billion. The United States Census Bureau has four official regions, with nine official divisions. A card puncher, part of the tabulation system used to compile the thousands of facts gathered by the Bureau. Holes are punched in the card according to a prearranged code transferring the facts from the census questionaire into statistics. The 1890 census was the first to use the electric tabulating machines invented by Herman Hollerith. For 1890-1940 details, see Truesdell, Leon E. (1965). The Development of Punch Card Tabulation in the Bureau of the Census, 1890-1940: With outlines of actual tabulation programs. US GPO. In 1946, knowing of the Bureau's funding of Hollerith and, later, Powers, John Mauchly approached the Bureau about early funding for UNIVAC development. A UNIVAC I computer was accepted by the Bureau in 1951. In order to reduce paper usage and reduce payroll expenses, 500,000 handheld computers (HHC's) were used for the first time in 2009 during the address canvassing portion of the 2010 Decennial Census Project. Projected savings are over one billion dollars. The further implementation of advanced computer systems in the planning for the 2020 census provides major challenges for an upgrade in the technological broadening of census protocol. Staff from the Current Surveys Program conduct ongoing and special surveys about people and their characteristics. A network of professional field representatives gathers information from a sample of households, responding to questions about employment, consumer expenditures, health, housing, and other topics. ^ "Census Population Estimates". U.S. Bureau of the Census. http://www.census.gov/popest/estimates.php. ^ "Census Information Centers". U.S. Bureau of the Census. http://www.census.gov/clo/www/cic/. Retrieved 2008-05-13. ^ Stern, Nancy (1981). From ENIAC to UNIVAC: An appraisal of the Eckert-Mauchly Computers. Digital Press. ISBN 0-932376-14-2. ^ Bashe, Charles J.; et. al (1986). IBM's Early Computers. MIT. ISBN 0-262-02225-7. The original version of, and subsequent additions to, this article were adapted from U.S. Census Bureau text. Geographic Areas Reference Manual from the U.S. Census Bureau contains detailed explanations of geographic terms used in the census. The mission and operation of the U.S. Census Bureau are laid out in Title 13 of the United States Code. This page uses content from the English language Wikipedia. The original content was at United States Census Bureau. The list of authors can be seen in the page history. As with this Familypedia wiki, the content of Wikipedia is available under the Creative Commons License.